Chow chow thogyal recipe| Chow chow chutney is an easy South Indian recipe made using Chayote squash also called as seema kathrikkai or bangalore kathrikkai. We usually make thengai thogayal at home, which is our family's favorite one. Recently my cousin was asking insisted me to post Chow chow thogayal, which her mom makes so often. I have posted Peerkangai chutney, which is similar to this chow chow chutney recipe. 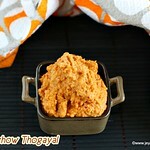 As i am travelling this week i want to share simple recipes, so tried the thogayal and sharing the recipe of the same. It tasted similar to the thengai thogayal. Description: Chow chow thogyal recipe| Chow chow chutney is an easy South Indian recipe made using Chayote squash also called as seema kathrikkai or bangalore kathrikkai. Peel the skin of the chow chow and chop them finely. In a pan add 2 tsp of oil and add in the urad dal, red chili and tamarind . Once done, add asafoetida and take it out from the pan. Add 2 tsp of oil and add the chow chow. Saute till the chow chow turns tender. Saute in a medium flame and be careful not to burnt it. Once done, allow this to cool completely. Grind this along with the roasted dal mixture and coconut. Once done take out from the mixie. Enjoy the chow chow thogayal with plain hot rice and ghee. Adjust the spiciness as per your taste. But the tamarind balances the spiciness of the chow chow thogayal. In a pan add 2 tsp of oil and add in the urad dal, red chili and tamarind. Just tried this on the weekend, it was so good. Thanks!